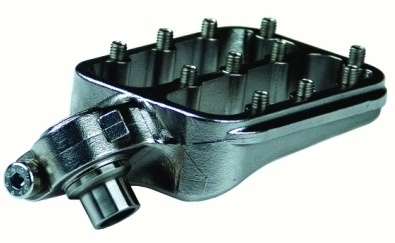 These pegs can be mounted in two positions where the first is about 2cm lower than standard GS and the other is close to 3cm lower than standard GS. I chose to install them in the lowest possible position and from just sitting on the bike it feels better than before. They are much wider (about double the width) and give much more traction for the boots when standing. I haven't ridden the bike with the new pegs on as Andrea came back with her parents from a trip to San Francisco while I was still installing them and therefore I didn't have enough time. The installation was pretty straight forward after checking out all the parts and the position for the springs. I pretty much ignored the instructions after reading them once as I didn't find them particularly helpful. The fit was a bit tight for the spacers that go on the bolt together the peg itself but it worked in the end and it took me about 20 minutes mounting them. Quite easy if you ever mounted footpegs on a GS. More pictures will be added tomorrow as I also didn't have enough time taking enough. I took some from the side with the OEMs installed and will try to get the same angle with the new ones so that there is a good comparison. Might not work out though, but I'll do my best.